1310 people want to go here. 280 people have been here. Australia is the only country that has a whole continent to itself. World famous for its natural wonders and wide open spaces, its beaches, deserts, "the bush", and "the Outback", Australia is actually one of the world's most highly urbanised countries. It is also well known for the cosmopolitan attractions of its large cities such as Sydney, Melbourne, Brisbane and Perth. The Great Barrier Reef is the world's largest reef system composed of over 2,900 individual reefs and 900 islands stretching for over 2,600 kilometres (1,600 mi) over an area of approximately 344,400 square kilometres (133,000 sq mi). The reef is located in the Coral Sea, off the coast of Queensland in north-east Australia. The Great Barrier Reef can be seen from outer space and is the world's biggest single structure made by living organisms. Uluru, also referred to as Ayers Rock, is a large sandstone rock formation in the southern part of the Northern Territory, central Australia. It lies 335 km (208 mi) south west of the nearest large town, Alice Springs; 450 km (280 mi) by road. Kata Tjuta and Uluru are the two major features of the Uluṟu-Kata Tjuṯa National Park. Uluru is sacred to the Pitjantjatjara and Yankunytjatjara, the Aboriginal people of the area. It has many springs, waterholes, rock caves and ancient paintings. The Sydney Opera House is a multi-venue performing arts centre in Sydney, New South Wales, Australia. It was conceived and largely built by Danish architect Jørn Utzon, who, in 2003, received the Pritzker Prize, architecture's highest honour. The Pritzker Prize citation stated: “ There is no doubt that the Sydney Opera House is his masterpiece. Sydney Harbour National Park is a national park comprising parts of Sydney Harbour, its foreshores and various islands. The park lies within the Sydney metropolitan area and was created in piecemeal fashion during the 20th century. Much of the harbour foreshores had been spoiled by residential development; what remained was preserved partly because of the presence of military bases, and partly because of the work of conservationists. Sydney is the most populous city in Australia and the state capital of New South Wales. Sydney is classified as an Alpha+ World City indicating its influence in the region and throughout the world. Sydney is located on Australia's south-east coast of the Tasman Sea. As of June 2010, the greater metropolitan area had an approximate population of 4.6 million people. Inhabitants of Sydney are called Sydneysiders, comprising a cosmopolitan and international population. 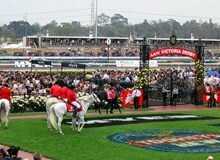 Melbourne is the capital and most populous city in the state of Victoria, and the second most populous city in Australia. The Melbourne City Centre is the hub of the greater metropolitan area and the Census statistical division—of which "Melbourne" is the common name. As of June 2010, the greater geographical area had an approximate population of four million. Inhabitants of Melbourne are called Melburnians or Melbournians. 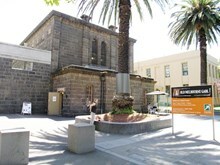 The Old Melbourne Gaol is a museum and former prison located in Russell Street, Melbourne, Victoria, Australia. It consists of a bluestone building and courtyard, and is located next to the old City Police Watch House and City Courts buildings. It was first constructed starting in 1839, and during its operation as a prison between 1845 and 1924, it held and executed some of Australia's most notorious criminals, including bushranger Ned Kelly and serial killer Frederick Bailey Deeming. Made up of 91,000 square kilometres of tropical wilderness, Arnhem Land is as unspoiled and remote as you can get. Its small population is predominantly Aboriginal people, whose traditional culture remains largely intact, making it a huge tick on our bucket list. Access to Arnhem Land is so restricted that only selected tour operators who have earned the trust of traditional landowners may bring visitors in. On Western Australia’s Coral Coast at Ningaloo Reef you can partake in the underwater experience of a lifetime. Every year, between mid-March and mid-July, these gentle giants of the ocean congregate in the Ningaloo Marine Park following the mass spawning of coral. They can grow up to 18 metres in length but are completely harmless to humans. 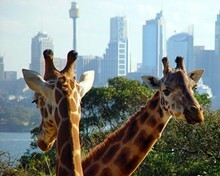 Taronga Zoo is the city zoo of Sydney, New South Wales, Australia. Officially opened on 7 October 1916, it is located on the shores of Sydney Harbour in the suburb of Mosman. Divided into eight zoogeographic regions, Taronga Zoo is home to over 2,600 animals on 21 hectares (52 acres), making it one of the largest of its kind. The peculiar pinnacles at Nambung National Park, Western Australia - These amazing natural limestone structures, some standing as high as five metres, were formed approximately 25,000 to 30,000 years ago after the sea receded and left deposits of sea shells. Over time, coastal winds removed the surrounding sand leaving the pillars exposed." 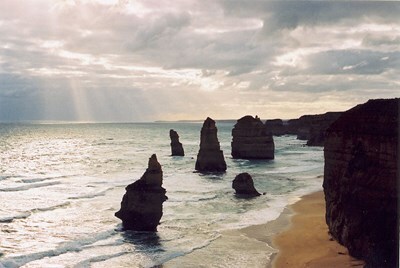 Hire a car in Melbourne and take a journey along the country’s stunning south-east coastline. Drive through the iconic surf spots of Torquay and Bells Beach, then onto the laidback town of Lorne and the spectacular Twelve Apostles.